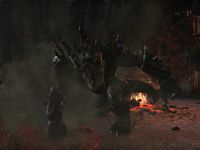 Horvantud the Fire Maw is a gigantic armored Daedroth found in City of Ash II. Horvantud has a chance to drop the unique item Fire Maw's Fang. During the fight, Dremora Beldakyn, Harstryls, Kynlurkers, Kynval, and Morikyn will drop down in the arena to assist him it the fight. "Show them how we treat visitors to the Deadlands!" "Come! We'll deal with you ourselves!" "The flame of the Fire Maw burns like a second sun!" "Break them! Break the mortals!" "The Fire Maw will purify you." "Let the flames consume you!" "You think you'll survive this?" "Come, greet the new day, and die!" "Prepare to greet the new dayâ€”and burn in it." "Come and greet the new day. It will be your last." "Prepare yourselves for the end!" "Let the battle be joined!" Horvantud sports the original green daedroth skin from Morrowind, due to his association with Dagon, as most daedroth are blue due to their alliance with Molag Bal. Hrelvesuu is the only other green daedroth in the game. Horvantud's Ground Quake ability does less damage as of Patch 3.1.5. 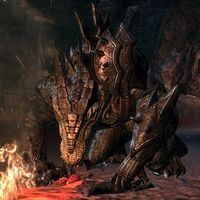 City of Ash II Vanquisher 10 Defeat Horvantud the Fire Maw, the Ash Titan, and Valkyn Skoria in City of Ash II. Deadly Deadlands Survivor 50 Defeat Rukhan, Marruz, Akezel, Urata the Legion, Horvantud the Fire Maw, the Ash Titan, and the Daedra at the bridge to Valkyn Skoria, before defeating Valkyn Skoria himself in Veteran City of Ash II without suffering a group member death. City of Ash II Assassin 50 Defeat Rukhan, Marruz, Akezel, Urata the Legion, Horvantud the Fire Maw, and the Ash Titan; reassemble the bridge; and defeat Valkyn Skoria himself in Veteran City of Ash II, all within thirty minutes. Timer starts when players enter the Inner Grove. This page was last modified on 24 March 2019, at 18:49.